Matt left out a critical word -- "random" in "nudging forward descent with modification." I don't and I don't know of any engineer I know who works with random modification -- rather is it is intelligently directly modification. You may have seen this linked elsewhere. I am happy to share it with you again. U.S. prosecutors and market regulators accused a Buffalo, New York-area investment adviser of operating a Ponzi scheme that targeted Catholics, including priests. Richard Piccoli, 82, was charged with mail fraud at federal court in Buffalo, U.S. Attorney Terrance Flynn said today in a statement. 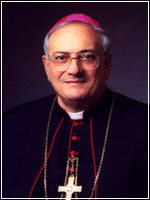 Piccoli placed advertisements in Catholic newspapers across the country while raising at least $17 million since 2004, according to the statement. I wish that priests, religious orders, etc. all sought the advice of independent and skeptical financial advisers and invest in insured institutions rather than hedge funds or unregistered fund managers. Mathematically, Madoff's fraud was about 3,000 times greater. Fr. 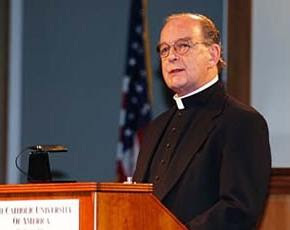 Richard John Neuhaus has passed away. Remember this priest when you recall the great priests you have known. I met him only once in person and thanked him for his work in First Things but I have read the Naked Public Square, Death on a Friday Afternoon, and Catholic Matters, and tried to see each of his appearances on EWTN. He was holy, smart, funny, and inspiration to all of us who want to proclaim that Jesus is Lord to a world growing ever more hostile to that good news. Please read some of the other tributes there and at the official memorial site. Is this a Catholic prayer? Dear friends, let us remind ourselves in this special place, on this special day, that we are in the presence of God. Lord, we praise You at this historic moment. You are the loving Father of us all, the merciful, the compassionate, the source of all wisdom, the giver of all gifts. We have so much to thank You for, dear God -- for our lives, our families, for our freedom and our opportunities, for our Nation and for the historic choice of leadership it has just made and, indeed, for the age-old values that are still enshrined in our Constitution and in our hearts. Sustain the Members of the 111th Congress in courage and in confidence as they face the daunting needs of this special time. Challenge them, Lord, not to forget the hungry and the homeless, the unborn and the immigrant, those without access to good education or decent health care, and those many men and women caught in a cycle of poverty from which they cannot escape without our help. Let our Representatives be builders of a better world--a world without war or violence, without oppression or corruption--builders of a new world whose foundations are human dignity, the values of family life and respect for the laws of nature. Lord, we pray: Make us always proud of those we have chosen to lead us so that, with their leadership and Your loving care, You may always be proud of us and of these United States of America. Amen. (1) "...the merciful, the compassionate" is frankly, a typical Muslim invocation of the name of the One-God-who-is-not-the-Holy-Trinity. (2) The jump from the Constitution which doesn't mention the role Congress in remembering the hungry and the homeless is breathtaking. Charitable giving in Catholic experience has always been a matter of private choice and not the government's mandate. (3) "Lord..make us proud" better spoken as "Lord...make us humble -- and always be in awe of You"
We have 2,000 years of experience with our version of the "Good News"
This campaign is as lame as those of Julian the Apostate and the French revolutionaries such as Robespierre. At least they were trying to create a virtuous society. When the Marquis de Sade and Nietzsche arrived they were both anti-God and anti-morality as well (at least as Christians understood conscience and the moral obligations among all people). The ideological descendants of the latter two have launched their very own propaganda fide. 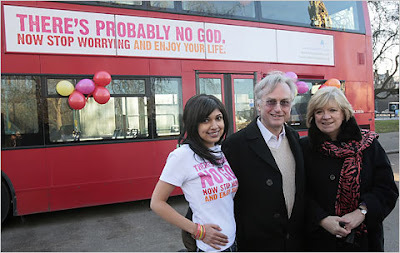 ...And then she thought, how about putting some atheist messages on the bus, as a corrective to the religious ones? And so were planted the seeds of the Atheist Bus Campaign, an effort to disseminate a godless message to the greater public. When the organizers announced the effort in October, they said they hoped to raise a modest $8,000 or so. But something seized people’s imagination. Supported by the scientist and author Richard Dawkins, the philosopher A. C. Grayling and the British Humanist Association, among others, the campaign raised nearly $150,000 in four days. Now it has more than $200,000, and on Tuesday it unveiled its advertisements on 800 buses across Britain. I believe in the free expression of religion, so let them even say "There is no God." and let there be a good exchange of views about the meaning of life and all those transcendent questions and see which version of the "Good News" is going to win the hearts and minds of the world. Fox News New York:An unholy theft happened in Brooklyn. Officials of the Diocese of Brooklyn said someone stole the Social Security number and birth date of its bishop and used the information to apply for credit cards. Bishop Nicholas DiMarzio's credit card company called to notify the cleric that someone was trying to open a new account in his name sometime during the Christmas holidays. Diocese spokesman the Rev. Kieran Harrington said the bishop called police. Harrington says the bishop was lucky because no money was taken and no cards were actually obtained. I am entirely in sympathy with the bishop. My name is rather common, and along the way linked in some databases to some deadbeats, so I get someone else's collection notices often. It will be interesting to see how much schadenfreude it engenders on the net. As I get up to speed with the other Catholic bloggers in 2009, I will mention a few blogs I have read and some comments I have posted. Unam Sanctam presented what I thought was a false dichotomy. It is common enough to lay out here and I also have some space to explain where I am in the middle of this. On one hand, there's Catholic Monarchism -- from Constantine to Blessed Charles I, Emperor of Austria. This is the ideal government is one that it Catholic from the top down and able to establish the Catholic Church as a state religion, and to encumber or even suppress the spread and practice of non-Catholic religions. When it comes to papal observations I take the insights of Pope John Paul II and Pope Benedict VI over that of Pope Pius IV who, in office from 1559 to 1565, would know nothing but monarchy. Excessive zeal -- seeking a short cut to establishing the Kingdom on earth as it is in heaven -- is its driving force. On the other hand, there is spiritual sloth -- Indifferentism, Syncretism, false Ecumenism -- it has many names. I don't think it's important to make a major argument against this now, just identify it. There's a big middle in the middle of the two. When I am, I am a big believer in the principle of subsidiarity and accountability. Small, visible local charities -- where people can give up all three: time, talent, and treasure. Uncoupling it all -- creates two evils: powerful politicians who control the flow of other people's money and a class of people becoming dependent on the government. I am likely the first (and perhaps only) blogger to declare admiration for both Dorothy Day and for Cardinal Spellman. In many ways, the inability for these two to work out some accommodation is the legacy we have contend with today. The sloth aspect of it comes in when you believe that you need to eliminate war, poverty, economic instability, and deadly disease before you can share the gospel. Those four, you might recognize as the Four Horsemen of Rev 6. The right sort of balance between the corporal works and spiritual works of mercy is "DOMINUS JESUS" written by Pope Benedict when he was prefect of the Congregation for the Doctrine of the Faith. So this is the new tolerance. The Catholic League thinks a share of the blame for this outrage goes to San Francisco Mayor Gavin Newsom and the San Francisco Board of Supervisors for ignoring the routine insults the Catholic Church has in the public life of San Francisco. When vandalism like this happens, there's a tendency to hush it up, lest others get ideas of their own and Churches get targeted more frequently. To start with, Hamas does not have to win this war. It can lose and still win. As long as no other political group can replace it in power, even as some of its diehards can continue to lob missiles, however ineffectually, into Israel, it achieves a moral victory of sorts. Moreover, if Mahmoud Abbas’s Fatah movement tries to replace Hamas in power, Fatah will forever be tagged with the label of Israeli stooge, and in the eyes of Palestinians will have little moral legitimacy. Israel’s dilemma is that it is not fighting a state but an ideology, the postmodern glue that holds together Greater Iran. It's a power vacuum that something other than Hamas has to fill when its over. Princess avoided the routine financial disclosure required by NYC employees. Even the people who worked under her filed the disclosure but she got a pass. And the excuse undermines her so-called qualifications -- she had no influence on policy and priorities at the city Department of Education. A personal observation from me -- who waits until they are 51 to decide, getting appointed to the Senate is what I really have wanted to do all my life, and, I haven't prepared a resume that would get me elected to the New York City Council? Today's extreme search is "Catholic urine"
Google news search for "catholic urine"
As you might expect the usual suspects are going into their silly happy dance over a report appearing in L'Osservatore Romano that found a connection between the urine of female consumers of oral contraceptives. The pill "has for some years had devastating effects on the environment by releasing tonnes of hormones into nature" through female urine, said Pedro Jose Maria Simon Castellvi, president of the International Federation of Catholic Medical Associations, in the report. A more local account is from Fox which quotes AFP which quotes L'Osservatore Romano which doesn't have online text. The contraceptive pill is polluting the environment and is in part responsible for male infertility, a report in the Vatican newspaper L'Osservatore Romano said Saturday. "We have sufficient evidence to state that a non-negligible cause of male infertility in the West is the environmental pollution caused by the pill," he said, without elaborating further. "We are faced with a clear anti-environmental effect which demands more explanation on the part of the manufacturers," added Castellvi. I don't think they are referring to a direct ingestion on the urine but to the urine going through the sewers and then somehow remaining biologically active in the next loop through the food chain. I don't think that that's a significant source. The real mother lode of estrogen is in additives they give to animals to fatten them or accelerate growth. I think the greens generally own that issue. The bigger problem is not impotence or instability but a whole set of cultural signals and economic disincentives given to women not to marry and to raise children. It's not an exclusively Catholic concern but natural law issue that a family is not only the incubator for children but for the whole continuity of the society from which the mother and father originate, hope for the future, and economic security for the people living beyond the years where they can work. The future, as always, belongs to families. Consider Italy, it ranks 204 out of 220 countries (and other regions) with 1.3 children born to each woman of child-bearing age. In other words, today there is 1 grandchild for every 3 grandparents -- in two generations, there will be only 1 Italian for every 4 Italians now of child-bearing age. Self-genocide. Those Roman Catholics are at it again. It seems they will stop at nothing to stop the production and use of contraceptives.